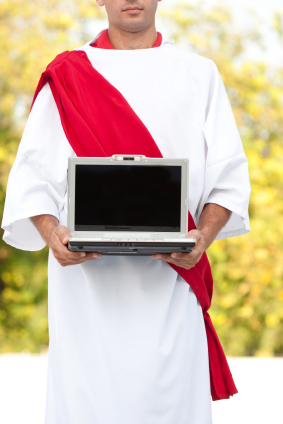 Is communication technology bad for religion, or does it simply change the way we worship? This question has been growing on the minds of parishioners and worshippers of diverse faith groups, who find it increasingly difficult to extricate new technological advances from their religious life. The answer seems to be a paradoxical yes and no—while technology has its downside in traditional religious observance, it also offers many benefits. In a bid to lure younger acolytes, some churches have incorporated new devices into their traditional services. Online church Web sites have become ubiquitous, creating a high-profile internet presence which provides resources for members and an overview of the church’s beliefs and practices for potential converts (for example, Universal Life Church Monastery’s Web site offers information on legal wedding officiation, religious literature, and links to its ministers’ network), but another way in which priests and ministers have managed to communicate their messages is by holding online prayer sessions, and even worship services, through mobiles devices such as smart phones and iPhones. As Stuart Fox of MSNBC notes, “hundreds of new iPhone apps allow parishioners to bring Bible quotes, Torah-chanting practice and Buddhist prayer wheels wherever they go, allowing them to practice their religions in new times and spaces.” Pastors can post sermons online, Muslims can podcast the call to prayer from the muezzin in Mecca, and the Dalai Lama provides updates on his own Twitter feed. So what motivates the misapprehensions of the few who see these rapid changes as a corrupting influence on the major religions of the world? Quoting Darleen Pryds, an associate professor of Christian spirituality and medieval history at the Franciscan School of Theology in California, Fox points out, “most people tend to disengage from the experience of communal worship, and there is a nervous, excited energy that pervades the room and takes over”; he also reports Dudley Rose, the associate dean for ministry studies at Harvard University’s Divinity School, as saying, “Even the people who think they [are great multitaskers] aren’t paying as much attention as they think they are. And how do you develop supplication when the very way you are communicating is so fragmented?” Rose goes on to say that this poses a challenge for churches trying to keep younger members who are put off by traditional paper texts. Then there is the upside to the influence of technological communication on traditional religious observance. Despite the disconnected, nervous excitement that accompanies the use of mobile devices in religious services, Pryds admits that “[e]ven if I haven’t participated in real time with the prayer service, the series of prayers are there in my newsfeed as a reminder”. So, in a sense, technological advances actually help us keep active in our religious observances. Mobile devices also help the believer literally to take their faith with them wherever they go, whether on the train, at the grocery store, or at the beach. Paraphrasing Rose, Fox reports that “[b]y allowing the faithful to engage in religious activity regardless of where they are, these apps allow worshippers to create a religious world around them, even if they are physically in a very secular environment.” Thus, the notion that spiritual or transcendent experience should be confined to a space within four walls replete with worn hymnals, hard pews, and an altar becomes obsolete, replaced with a more interactive, omnipresent spiritual experience. made spiritual insight accessible to the average person by rendering Bibles inexpensive and common-place; the only difference is that now one can read passages from the holy book of your choice on your mobile internet telephone gadget. Of course, just like those who criticize online minister ordination or the blessing of laptops and mobile phones on Plow Sunday, technologically savvy religion will have its critics, who will label the new mode of worship as “tacky” and “irreverent”—but every innovation in style of worship seems tacky and irreverent to the conservative. So, despite its drawbacks, internet religion is proving to be a highly efficient and popular means of spreading spiritual insight and messages to the faithful, and a chief means by which religion in general will adapt and flourish in the near future.